Born in Croppa, Värmland County. Wallenberg entered Uppsala University in 1792, received his doctorate in medicine in 1806, and was appointed botany demonstrator in 1814, as well as professor of medicine and botany in 1829, succeeding Karl Peter Thunberg. He was the last holder of the unshared chair that Linnaeh occupied in the last century. After his death in 1851, the department was divided into more limited professorships. Wallenberg did his main work in the field of plant geography and published, among other things, Flora lapponica (1812) and other works on the plant world of the most northern Sweden. 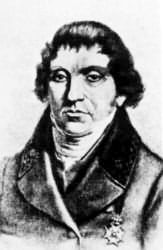 He was one of the first major scientists to contribute to the taxonomy of plants and the geography of the High Tatras in the Habsburg monarchy, where he conducted research in 1813 (he also determined the elevations of the mountains, but some of them were later refuted by Ludwig Greiner). Two of the highest mountain lakes in the Tatras, now in Slovakia, are named after him in the Upper Walenberg Ples (altitude 2157 m or 7077 feet) and the Lower Walenberg tarn (Lower Walenbergovo Pleso; 2053 meters or 6736 feet) in his memory. Wallenberg was elected a member of the Royal Swedish Academy of Sciences in 1808. Along with Alexander Humboldt, he is considered the founder of geographical botany. In the Encyclopedic Dictionary of Brockhaus and Efron, Wallenberg is named the most prominent Swedish botanist after Carl Linnaeus, and about his book Flora lapponica (1812) it is said that it constituted an era in botany. Mountain height above 900 m in the north of the Nathorsta Land. Coordinates 77° 43.2'N 15° 35'E. 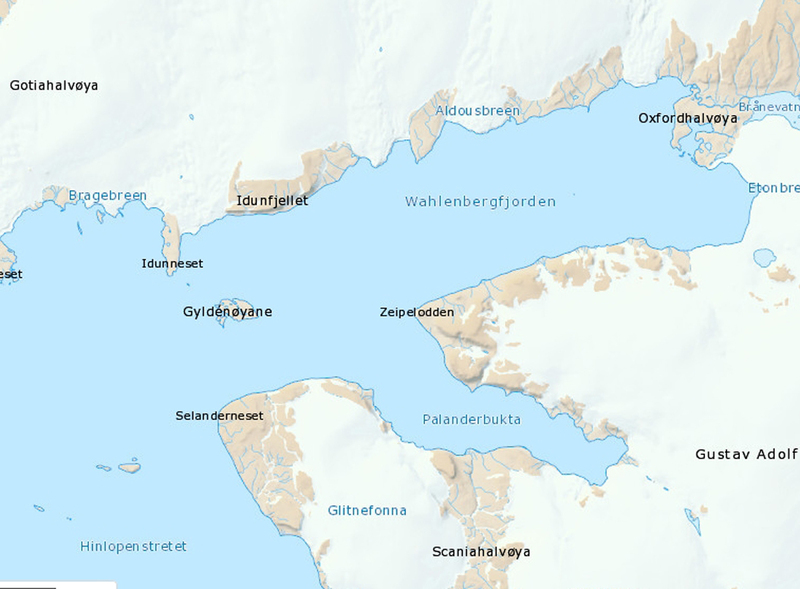 The glacier is 26 km long in the extreme east of the Oscar II Land, West Spitsbergen. The coordinates are 78° 31.0'N 14° 02.0'E. 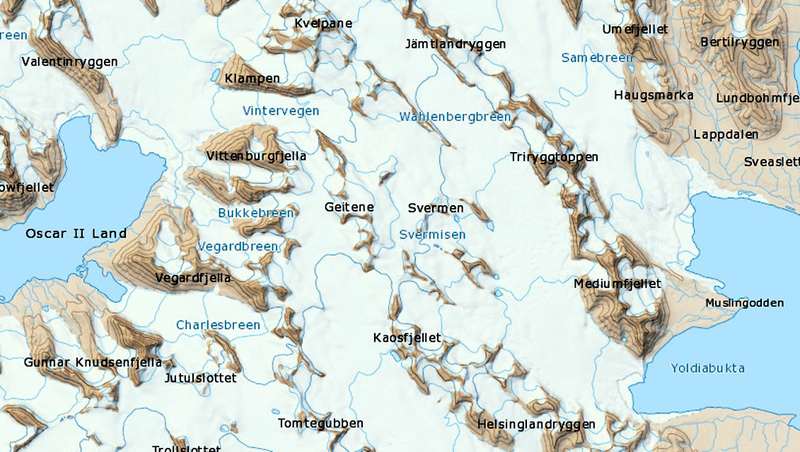 The fjord is 46 km long and 15 km wide in the northwest. 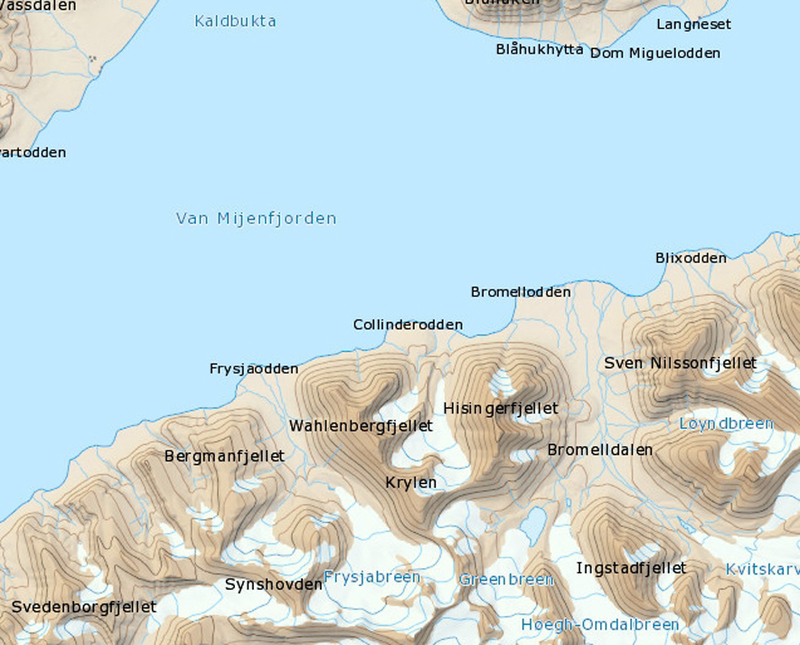 Northeastern Land, Svalbard. The coordinates are 79° 40'N 20° 00'E.